The fresh, deep fragrance of the woods brought by Thymes Forest candles creates an outdoors-in feeling in your home, inviting you to breathe deep and relax. 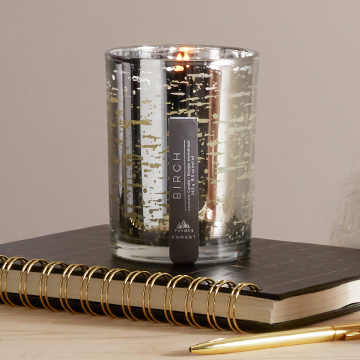 Each candle in the Forest collection has the unique fragrance of the woods it represents: Birch, Cedar, or Maple. The vessels and etched wooden lids are decorated to resemble the woods each scent evokes for a rich luster and nod to nature. It's a certainty that Robert Frost was thinking of wild woods like this once; the Thymes Forest Collection brings together the mystery and depth of the forest in layers of aroma and heady herbs. The enchantment of those textures, the density of smells and sounds on the air are all called to mind in this new collection that invokes the wild beauty of the forest - and may inspire you to your own poetry as well. "Lovely, dark, and deep," indeed.